Refuge Temple Ministries of Atlanta v. City of Forest Park. The Becket Fund for Religious Liberty (n.d.). Retrieved from https://www.becketlaw.org/case/refuge-temple-ministries-atlanta-v-city-forest-park/. Refuge Temple Ministries of Atlanta v. City of Forest Park. (Apr. 04, 2019). https://www.becketlaw.org/case/refuge-temple-ministries-atlanta-v-city-forest-park/. "Refuge Temple Ministries of Atlanta v. City of Forest Park." The Becket Fund for Religious Liberty. Accessed [Apr. 04, 2019]. https://www.becketlaw.org/case/refuge-temple-ministries-atlanta-v-city-forest-park/. 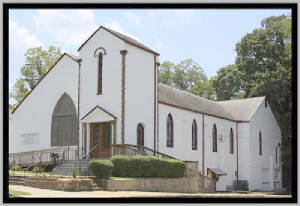 Refuge Temple Ministries of Atlanta is a small church founded in December, 1997. Its approximately 50 members had been meeting at the home of Pastor Harry Simon and various other buildings, and sought a permanent home for the church. In August, 2000 they negotiated a lease for a property in Forest Park, a suburb on the south side of Atlanta. The building, at 770 Main Street, is located in the city’s C-2 (“central commercial”) district, which permits “churches and other places of worship with attendant education and recreational buildings” as permitted uses. On August 11, they obtained a Zoning Verification from city officials, signed the lease, and prepared to occupy the property. They spent nearly $14,000 on a first-and-last-month deposit, renovations and utilities. On August 29, city officials notified Pastor Simon that they had approved the zoning application in error, having been unaware that the City Council had adopted a new zoning ordinance just four days earlier. The new law required churches to obtain a Special Land Use Permit in order to occupy property in the C-2 district, although it continues to allow other similar uses – private clubs, lodges, theaters, auditoriums and other places of assembly – without such a permit. The church proceeded to apply for the special permit on September 8, but although no one appeared in opposition to granting the permit at meetings of the Zoning Board and City Council, on December 18, the Council voted to deny the permit without explanation. On April 12, 2001, Refuge Temple Ministries filed suit in Federal District Court for the Northern District of Georgia, in Atlanta, charging the City of Forest Park with violations of the U.S. and Georgia Constitutions and seeking relief under the Religious Land Use and Institutionalized Persons Act of 2000 (RLUIPA). On June 4, the city council repealed the ordinance. On October 19, 2001, Refuge Temple Ministries moved for partial summary judgment.